Julia Sweeny ......She is best known for her roles on Saturday Night Live, especially as the androgynous character "Pat." 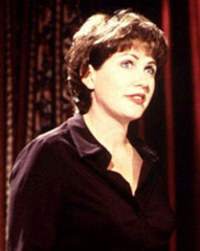 She is also well known for her critically acclaimed 1996 one-woman monologue, God Said, Ha! in which she treated her experience of surviving cancer. Sweeny has a new Cd out called Letting Go of God that takes a look at her search for God and her dealing with her Catholic parents, Mormons, Evangelicals and various other faith groups. You can watch a snippet over at TED (one of my favorite sites, TED is a event that happens every year where they bring in about 1000 people to brainstorm and talk ideas). Anyway Sweeny's journey is an interesting one, as she struggles to find a relationship with God she continually runs into religion. She has not found that relationship yet. It's a pretty good reminder for me to not create barriers for people to walk into, to not get caught up in the do's and just remember it's done and to love people and let them know their loved by God. She's pretty funny to. So I'm doing the late night TV thing last night and I stumble on to The Messengers on TLC. Very cool show. ( all though quite frankly I'm sick of the Survivor meets American Idol rip offs and the good cop bad cop thing). Robert Schuller from the Crystal Cathedral is the good cop on this. Anyway basically the people on the show are put into a situation and then given 2 minutes each to do a "message" on that. Last night they worked in a migrant farm type situation all day and then had to speak on struggle. It was very cool hearing a one topic message in 2 minutes. I thought many of them did a really good job getting their point across with both information and application in that time period. I was also quite surprised how many of them spoke of God and Faith. Turns out one of them is a Pastor and others have definite ties to varying communities of faith. But I just don't get American Idol. Somebody help me see the light. I'll admit I've only seen the show twice and it's probably because of my punk and metal roots that the whole premise and thought of it just creeps me out. ( Although I give cu dos to Simon for being smart enough to come up with the idea and to get the artists to sign everything away )( tongue in cheek) .Anyway I was fixing a buddies computer last night and it was on in the background while we were working and I just don't get it... Each time I've seen it all the contestants... flaky pitch.. all over the place dynamically, forced performances. I think if I was at a club I'd walk out. Again I dont' think they terrable and they are certainly more talented vocally than I .I'm not judging them, I could not do what they do. And yet I just don't get the fascination. Last year when Rock star Inxs was on every time I watched it it was like...wow these guys can play.. and sing...and they are engaging.... American Idol...not so much. I just don't get it. David Blaine is one interesting cat. His discipline is fascinating to me, I'd love to have a conversation with him. Just see where he is and what he's about. So we went off to Ann Arbor today to shoot a M.O.S. video. It was Jason Eil, Eric Clark and Kyle Mitchell our youth Pastor. Kyle was the interviewer and Jason and Eric and I shot. The funny thing is that Jason's un cle is a cop in Ann Arbor and Jason worked it out with him as a joke to have Kyle arrested for solicitation and disturbing the peace. All unbeknown-st to Kyle. It was pretty funny watching Kyle talk to the cops. Much to Kyle's credit he didn't flinch he spent the whole time trying to get Jason's uncle to answer the interview questions he was asking. Here's a pic of Kyle and J talking to a young lady on State st.
What boxes am I working in?